While I was in the Netherlands, I received a message of one of our team members in Uganda: “Things are not okay, I need your support and guidance when you come back.” Okay, that doesn’t sound good… Back in Uganda, it was obviously time for a good talk together. It turned out that there was quite some gossiping going around within the team. Of course this happens within any team but now it had reached the point that people’s feelings got hurt. How do you address this in a team? Especially within a culture where being open and honest is not a very common practice? In our leadership workshops for the leaders of the schools, we address the topic of giving feedback to each other. One of the rules on how to give feedback, is to be honest. Many times it happens that participants ask: “Being honest, how does that work?” This is a serious question as this just doesn’t happen very often. It is much more important to please someone than to be honest and open about what you really think. To me this confirms time and again that the Dutch are very direct. 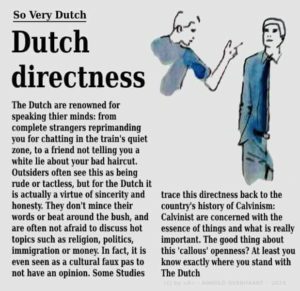 Of course it is not new to me that this is how the world considers the Dutch. But to be honest, I do not consider myself to be very direct. There are different levels of being direct in my opinion. But even the lowest category that I consider myself to be part of, is way more direct than any Ugandan will ever be. To me it is only logic to address things that I do not agree with. But things are not that cut and dry in Uganda. Even less so if you would disagree with your boss. The past 3 years, I have worked on reaching a level where the team in Uganda tells me when they disagree with me or someone else. It is important to me to ensure that they dare to be critical and dare to express themselves. Funny thing is that the team member that has worked with me from the start, dares to share the most of her views. The team member that joined the team last year, the least. This means that it demands time and dedication to create this new culture within our team. It requires trust amongst each other and being consistent. It is important to always motivate the team to share their views. And to show that when you do not agree, you do not get punished but have a good discussion about things to get to know each other’s views. The team will all agree one thing about me and that is that I always ask: “Why?” In a culture where people like to please others, people tend to want to give the answer that you are looking for. And that is exactly not what I want as an answer. And I now know that the first answer that I get is never the real answer. So I ask again: “Why?” A tough challenge for the team that represents a struggle: Is she testing us?! What does she want?! Time has taught the team that I am serious and sincerely want to know what they think and want to talk about it. My goal is for everyone to be able to critically think for themselves and to dare to express their thoughts. I don’t want people to just do what I tell them to do. I believe that this way we reach progress together and learn from each other. This year started with the first new Country Director in Uganda. This did not work out as expected for all parties involved. While I was away in Cameroon, she decided to share with the team all that she did not like and most especially what she did not like about me. When I came back to Uganda, the team shared what was discussed with great detail. At that moment it caught me by surprise. At that moment I decided to focus on what was most important. Most important was that they felt free to share all of it with me and to keep working towards our future together. Of course it affected me as a person but I decided not to share this with the team and to keep things professional. But this is a perfect example where I was the subject of the talking about someone and the whole team was part of it at that time and therefor can relate to the situation. During a team meeting, we discussed what had happened once again. I shared briefly that it had hurt me as a person in order for all to understand how it affected me. Central topic was how the team felt about it, looking back on it. Every team member shared their views and feelings. Eventually it turned out nobody was happy with how it had gone down. We ended the day with the question: “What lessons do we learn from this as a team?” The outcome are rules that we will use as a team in order for the team to work better together. Beautiful rules as respecting each other, listening to each other, learn from each other, share challenges etc. I could not have wished for a better outcome. The rules that the team came up with, are unwritten rules that we probably all know and agree with. I believe it is good to say these rules out loud to each other every once and a while as a team. It is important to address them as we tend to forget them as we go about our normal day and work. One of the rules also was: let the past be the past. A fitting closure of the team day and past period. The future is already presenting itself in the form of the new Country Director. A new start, a fresh new energy for the organisation. A very welcome change. The new Country Director and I have been working together for a month now. It feels good and provides confidence. We have also just had the interviews for the position of Deputy Country Director that we are also going to hire. Everything is focussed on our future: on the road leading to a self-reliant and completely Ugandan organisation by 2019!